Before the development of dental implants, dentures were the only alternative to replacing a missing tooth or teeth for our Erie, PA patients. Not everyone in Erie, PA is a candidate for a dental implant, however. 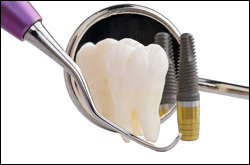 For a successful implant to take hold, a candidate must have proper bone density and have a strong immune system. In all cases, dental implants require strict oral hygiene. For more information on Dental Implants in the Erie, PA area call Modern Dental Group at (814) 456-0710 or (814) 836-1110!